Providing quality cleaning products for more than 40 years. Our philosophy is to understand and exceed customer expectations, build long term relationships and continuously review and improve our processes, services, and products. Our goals are to treat customers with honesty, courtesy, and respect and provide customers with value through competitive, high quality, innovative, environmentally conscious products, services, and training. We exemplify the highest level of communication, cooperation, commitment, and trust and improve productivity within your budgetary guidelines to save you time and money. Manual cleaning is hard, demoralizing work – bending, reaching, and scrubbing! It’s the main reason restrooms continue to be the largest source of complaints and the biggest cleaning headache for facility managers. With traditional, manual methods, surfaces rarely get the thorough cleaning they need, creating unsightly conditions and the perfect breeding ground for odor-causing bacteria! Hillyard Cleaning Companions makes cleaning touch free and easy – everyday! Surfaces in bathrooms, like the undersides of fixtures, partitions, and grout lines will finally get the attention they deserve, improving restroom facilities, cleaning quality, and staff morale! CCAP is a budgetary and work loading program that gives you standardized training tools in multiple formats designed to reinforce best practices with existing employees or quickly bring new employees up to speed. 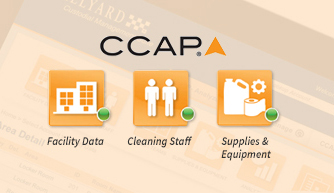 Each CCAP training module builds on a specific task list for each “Area Type” in CCAP. The training tools are “Ready to Use” or may quickly be customized for your facility. The training content includes over 50 market segments. How many people should it take to clean our facility? How much product should we be using? How can we improve quality? How can we lower our cleaning costs? We align ourselves with only the best equipment manufacturers in the country and Karcher and ProTeam are two of the best. Karcher North America is the leading manufacturer of commercial, industrial, and consumer cleaning equipment in North America. 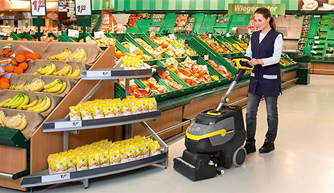 Their commercial and industrial grade, floor-cleaning equipment features innovative cleaning solutions. ProTeam is recognized as the original innovator of lightweight ergonomic backpack vacuum cleaners. They are committed to providing products and services that improve energy efficiencies and reduce potential harm to the environment.